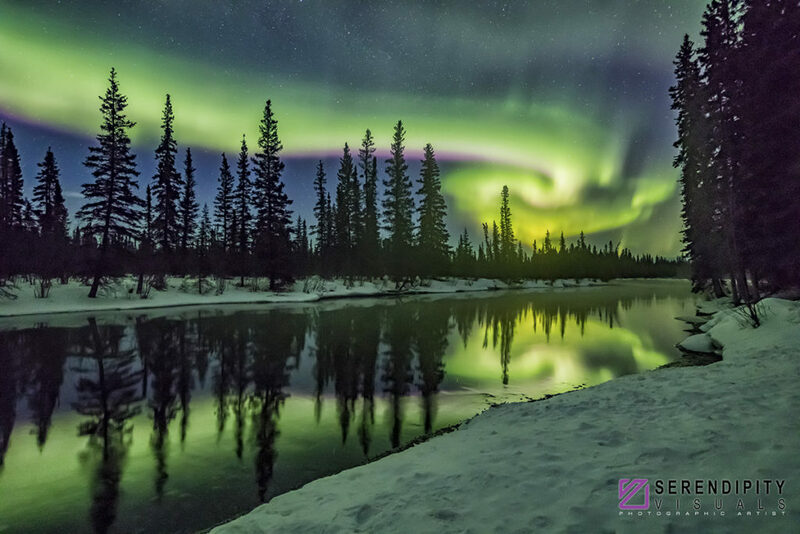 Photographing the Aurora Borealis in Alaska! 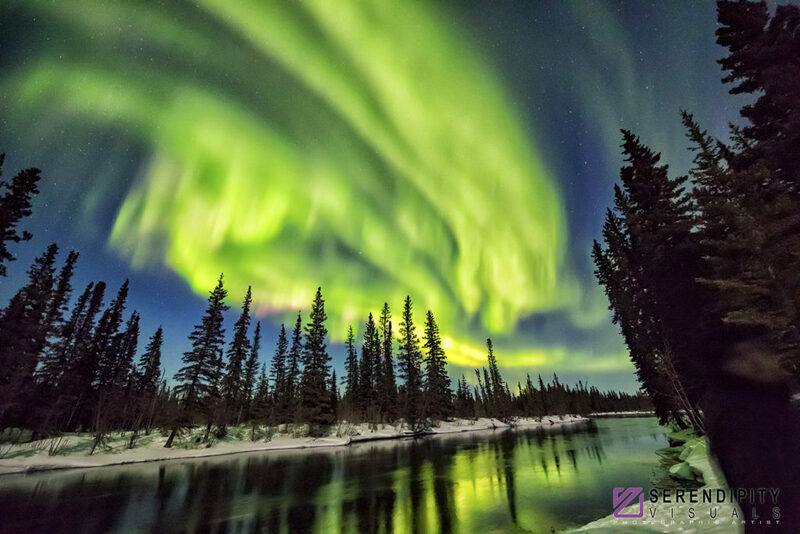 As this year’s spring Aurora season comes to a close, I was thrilled to be able to bring two Destination Workshops to the Fairbanks area to chase the elusive northern lights in the sky for CanonUSA. At this time of year, each day would grow longer by 6 minutes, as the dark skies around the Arctic Circle are now considered the land of the Midnight Sun. The sun will not set again until late August making it virtually impossible to witness the Northern Lights anywhere in the northern latitudes, until darkness returns. We were blessed with having a remarkable show each evening that we were out. 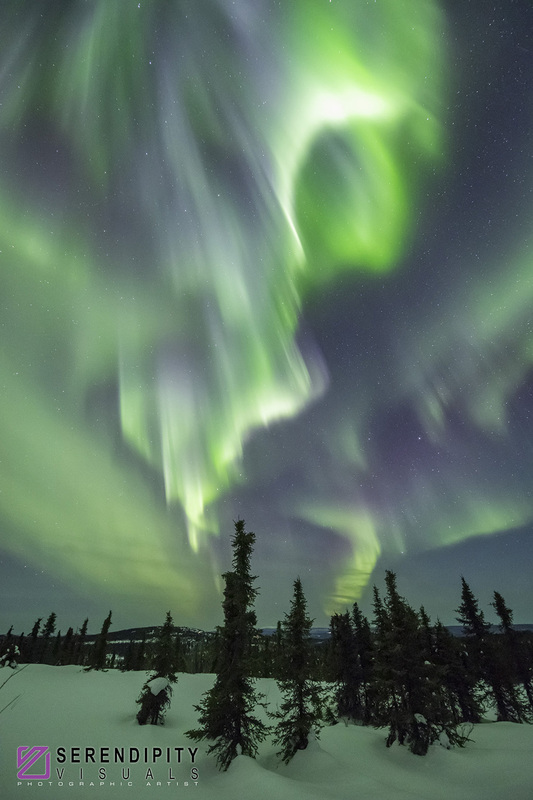 Needless to say, our wonderful guests were treated to nightly shows that thrilled both classes of photographers that traveled to Alaska from across the USA. 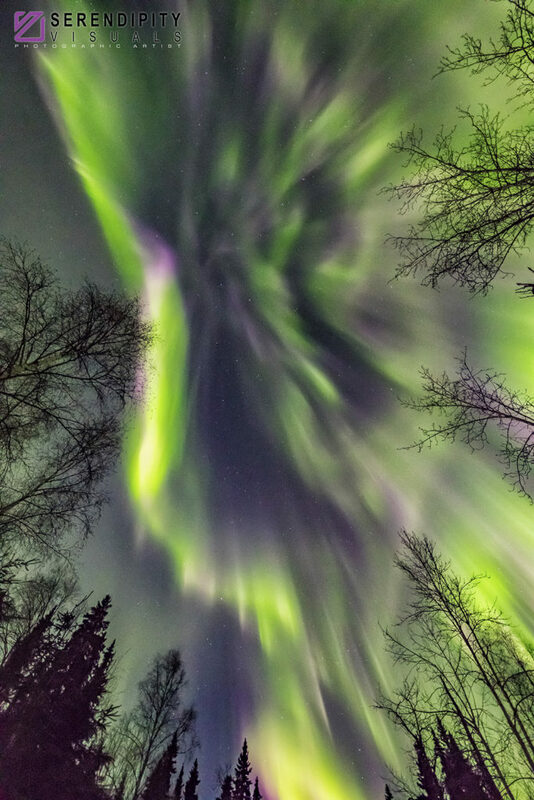 To my knowledge, everyone that attended our workshops had never seen the Aurora before. Once the lights arrived, the attendees cries of joy were thrilling to hear as they made their exposures in the near 0 degree fahrenheit night time air. Everyone dealt well with the late night or early morning arrival of the colors dancing across the sky. It was so wonderful to learn of this bucket list item being accomplished by everyone that joined us. 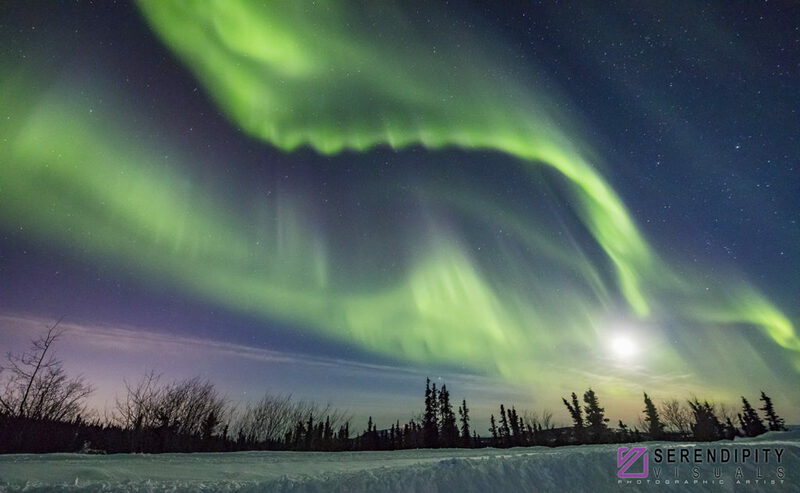 Armed with their favorite Canon HDSLR bodies like the EOS 5D Mark IV and wide angle lenses ranging from the EF 14mm 2.8, 8-15mm f/4 fisheye, the EF 24mm 1.4 or EF 16-35mm 2.8, our attendees were able to capture both the Alaskan snow-covered landscape along with the dancing lights. 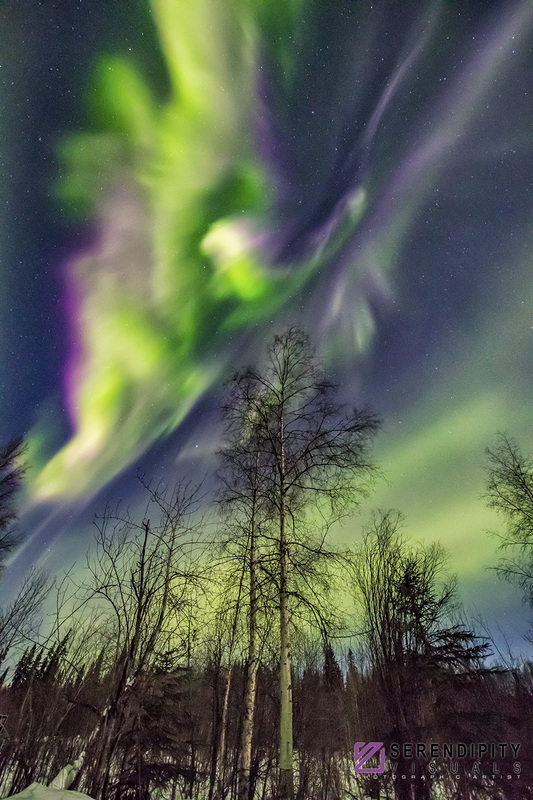 As you view this collection of my images, you will recognize that the shapes of the Aurora are always different. They often take on recognizable shapes that we can associate with. One very special capture was the answer to a prayer for me. From my first night out with my team, prior to the attendees arriving, I shared my prayer with my Canon colleagues. We recently lost a dear Canon family member. Chuck Westfall was the voice of Canon, a very knowledgable, soft spoken and one of the kindest men you could ever hope to meet. Chuck left us one week prior to the beginning of the Aurora workshops. 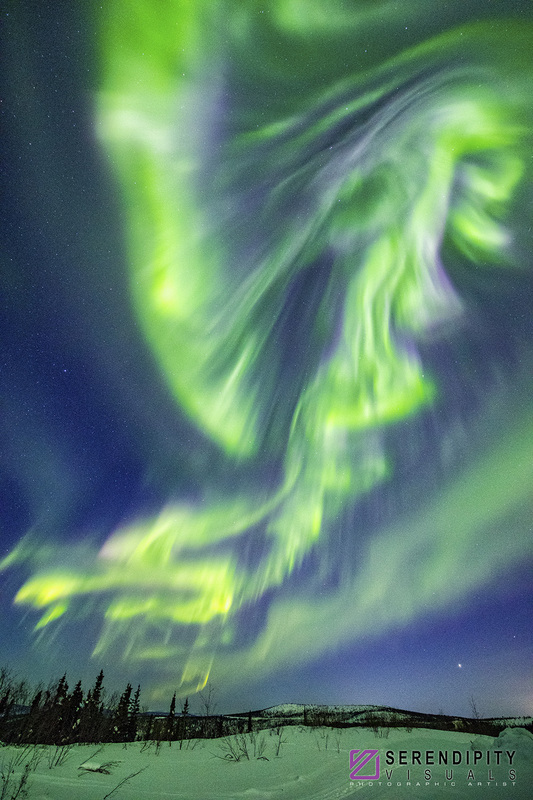 I was praying that I would be sent a special shape Aurora that I could capture and gift to Chucks wife. I was ecstatic when I saw the image below and knew that this a perfect sentiment to share with his family. A heart. Love. We enjoyed a visit from the local National Park Ranger each week to educate our class on the history and diversity of Alaska. 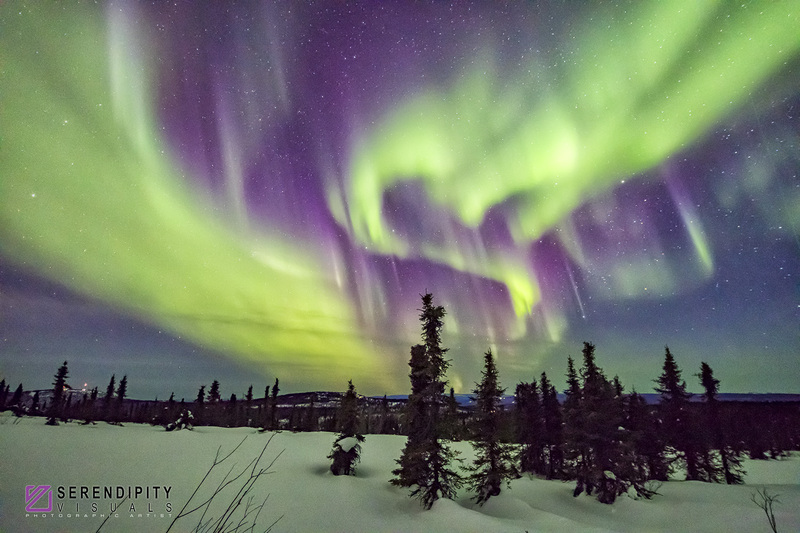 Even in March, the Alaskan landscape was blanketed by 3-4 feet of light, powdery snow. We would need to be mindful to walk only on snowmachine packed paths so as not to sink in to the waist deep powder. No matter what direction we were able to see, there was something exciting to see. The Aurora is in constant motion so we needed to be quick in composing and then exposing before the scene changed totally! 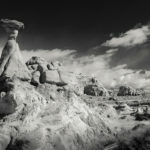 The two images above are 180 degree panoramas created by capturing 11 vertical images on my EOS 5D Mark IV and assembled in Adobe Lightroom. This image above is something special that I would like to share with you. If you look closely, you may see the shape of a face in the upper right portion of the photograph. What do you see in the image? What is your interpretation of the gift from the heavens? We all see something very different. I’m interested in hearing from you with your thoughts. Please let me know. 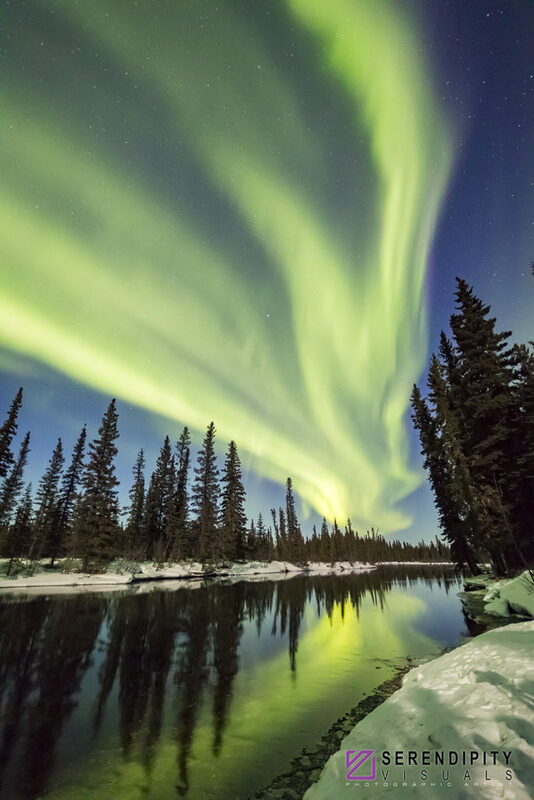 I hope that you might consider joining me and reserve your spot to come witness the Aurora Borealis in the fall of 2018 or the Spring of 2019. If you are interested, please send me an email at Ken@serendipityvisuals.com and I will place you on the list. I am in the final stages of planning both workshops now. Details will be available very soon. such beauty! You caputured the true essence of the aurora!! Magnificent t!! An amazing and unforgettable experience; also very educational. Many THANKS to Ken Sklute and the Canon Live Learning Crew. Highly recommended. Thank you Jorge! Glad to have had you with us! Absolutely amazing Ken! The image with the heart is definately a special gift from heaven for the Westfall family – nice work! The image with the face reminds me of an old genie with a large head of hair that just escaped from a bottle located somewhere behind the treeline. I agree with the Genie thought! Thank you! 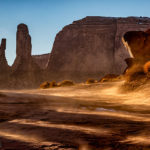 These images are stunning! I believe this is a workshop those who were blessed to join will never forget! 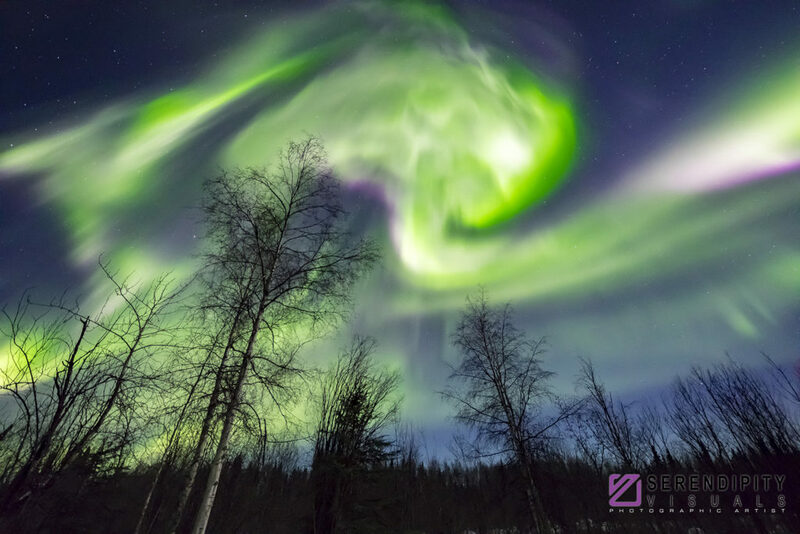 Ken what a spectacular group of Aurora images! Thanks Roger! It was a remarkable couple of weeks! Ken, your work is fantastic! 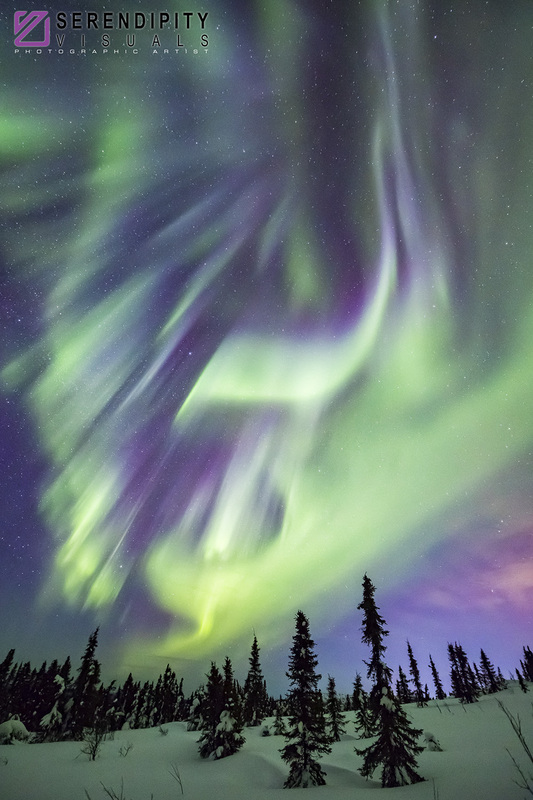 The Aurora Borealis and Alaska together – Wow! Thanks for sharing! A stunning tribute to our dear friend and colleague Chuck. Heck yea I’m interested! I’ve yet to see the Aurora dancing above me. Amazing! Absolutely incredible Ken! You are the best! It was a wonderful and moving experience Ken! Thanks so much, and for all that I learned from you too!!!! Thank YOU Nancy! It was wonderful to have you there!I look forward to seeing your growth! It was such an amazing experience to be there in Alaska learning from you Ken! I’ll never forget it! Thanks so much for all you taught me. Your workshop was an absolute blast! I hope to do it again sometime! I see an angel in “a gift from the heavens,” Ken. Beautiful work! I so want to do a workshop with you—I enjoyed your teaching style. Thanks Victoria! I hope that you can make it out to one of my workshops! These images are absolutely fabulous! 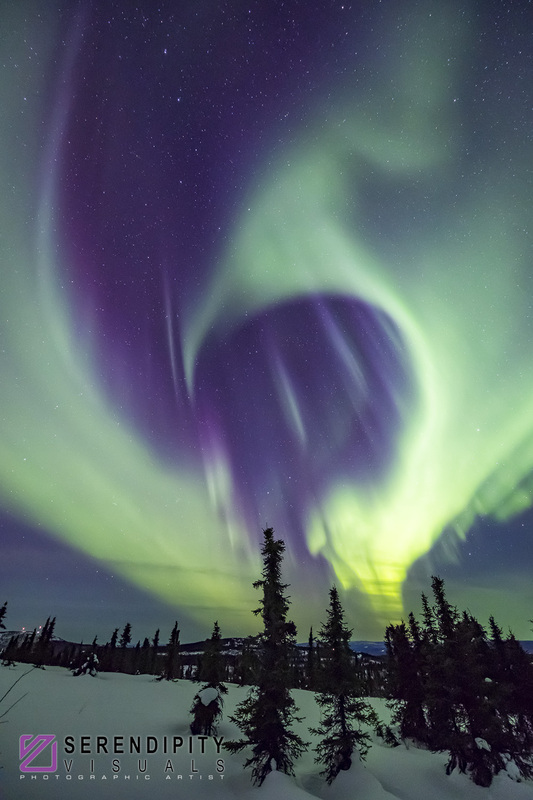 I was especially touched by your tribute to your long time friend, Chuck Westfall and the emerging “heart” aurora. Magic does happen and prayers are answered! Your capture of that moment was a blessing for you and his family.